Thanks to the renting of our light and state-of-the-art audioguide earphones, the tour guide is able to contact members who trail behind the group or who may become lost. They can speak even whilst the group is on the move, explaining more details about the site and adding anecdotes or little-known facts to the standard explanations that might not be heard otherwise. In this way the visitor can appreciate all facets of the site, stopping briefly to take a photograph or to contemplate the details of each explanation without the risk of missing anything. Time can truly be optimized, lending new rhythm to a tour. These devices, now obligatory in many tourist sites, museums, and churches, are drawing approval from tour guides who consider them an indispensable tool for their profession. Thanks to the practicality and potential to add quality to any type of tour, these audio guides – light, comfortable, equipped with the latest technology assuring the highest quality of transmission and reception – have become an essential technology that is absolutely recommended for groups of all sizes. 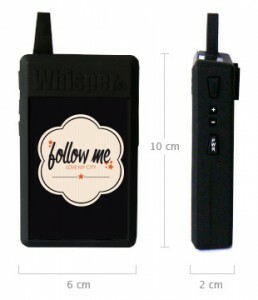 FOLLOW ME is an initiative for renting professional microphones, receivers, and earphones for guided tours. Prices are competitive for our clients, be they guides, tour leaders, tour operators, or large or small groups. Based on shared principles of professionalism, courteousness, and accessibility, FOLLOW ME is at your service to rent audio guides at the principal tourist sites of Siena and its provinces (San Gimignano, Chianti, Monteriggioni, Pienza, Montepulciano, Montalcino, and Val d’Orcia). Determination, technology, immediate assistance, and flexibility are the essential elements of the FOLLOW ME service. We provide quick delivery and pickup of the microphones and headsets in strategic locations of the city to assist guides and tourists, promptly responding to any changing needs.